Mural painting in a grand house was a sure indicator of wealth and status. Noble or wealthy families commissioned artists, often from France, The Netherlands or Italy, to decorate their homes with mythological, patriotic, allegorical or fantasy scenes, demonstrating the owner's learning, allegiance and sophisticated taste. 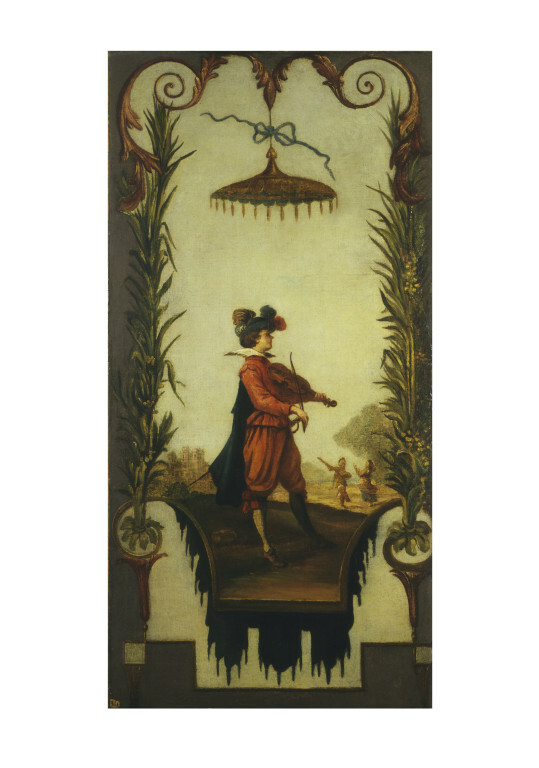 These are a part of a series of 16 panels commissioned by Charles Calvert, 5th Baron Baltimore, in 1742 to decorate the 'Scaramouche Parlour' in his house, Belvedere, in Kent. The panels show scenes from the Commedia dell'Arte, a type of theatre performed by Italian troupes of travelling actors. The Commedia had a large number of stock characters: the actors would improvise around a general scenario. They were often masked, and the performances involved acrobatics, music and dancing. Characters included the Capitano, a swaggering, blustering coward who invariably runs from any threat of danger, Arlecchino (who became the Harlequin of pantomime), Pulcinella (who inspired the English Punch), Pedrolino (later Pierrot) and Colombine (a serving maid who later appears in amorous association with Harlequin or Pierrot). Most depictions of the Commedia characters are derived from a famous series of prints of Commedia-like performers, the Bali di Sfessania by the French artist Jacques Callot (1592-1635). Andien de Clermont (active 1716-1783) was a French artist who arrived in Britain in 1716. He was the most avant-garde and highly-inventive decorative artist working here in the Rococo period. 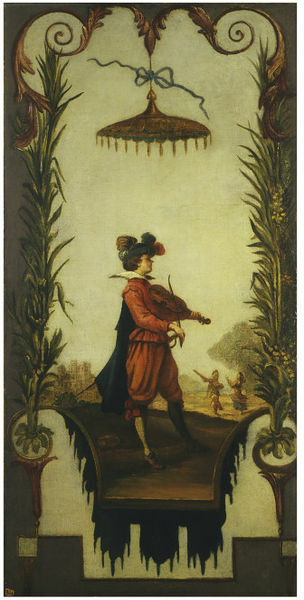 A young man playing the violin stands in profile in the foreground of a landscape setting. In the background to the left is a building and to the right two dancing figures. The whole is enframed by foliage border. Sixteen panels were commissioned by Charles Calvert, 5th Baron Baltimore to decorate the 'Scaramouche Parlour' in his house, Belvedere, in Kent. Painted in England by Andien de Clermont (active 1716-83). 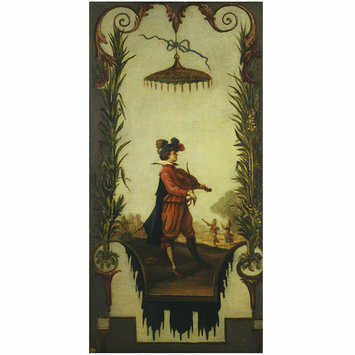 Sixteen panels were commissioned by Charles Calvert, 5th Baron Baltimore to decorate the 'Scaramouche Parlour' in his house, Belvedere, in Kent. Painted in England by Andien de Clermont (active 1716-83). The majority of the figures are taken from Jacques Callot's Balli di Sfessania, 1621; reproduced in Lieure catalogue de l'oeuvre gray de Callot, 1927, figs 379-402. Also reproduced with accompanying essay in Gerald Kahan Jacqcues Callot - Artist of the Theatre, 1976, pp.9-20. There has long been disagreement concerning the attribution of names to the three characters despicted in Callot's Frontispiece (Lieure 379). Hence P.24-1985 by de Clermont which is based on the frontispiece is descrived simply as Three Figures. Provenance: Charles Calvert, 5th Lord Baltimore; Sir Simpson Gideon Bart, later lord Eardley; Lieutenant Colonel F. D. E. Freemantle; Sotherbys Monaco 8 February 1980, 124, 2. Purchased by the V&A 1985Purchased by the V&A 1985.